Bronze Nazareth was born in the isolated underbelly of Grand Rapids, Michigan where his love for hip hop was fostered by a group of friends wanting to escape their rough existence through the power of music. At sixteen, Bronze formed a group with his high school friends that planted the seeds for his future in music. He and his group “The South House Click” attempted to record their music, but lacking resources, never got the chance to record their dreams. While no actual recordings materialized, it was in this inner city home that Bronze’s creative spark was cultivated. 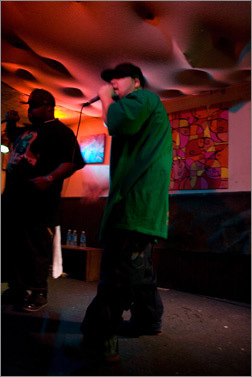 About a month ago I saw this ad on myspace that was spreading the word that Wu Tang Clan Member Bronze Nazareth was doing a show in Green Bay and my eyes nearly popped out of my head when I saw that it was going to be at IQ's. I immediately contacted IQ's just to confirm the ad was real, the confirmation was positive. If you don't know the Wu Tang Clan, Bronze Nazareth or IQ's bar, I will take a moment to explain to you why just the idea of this show coming to fruition was surreal! To start, The Wu Tang Clan has been an underground influence in all of hip hop / rap music today, though sticking to Wu's true roots, Wu Tang never sold their souls to become commercialized, instead they continued to craft the music and grow their family of artists independently. Bronze Nazareth entered the Wu Tang Clan family earning his keep as a producer, serving up beats and loops for the Clan. Now Bronze Nazareth reps his home town Detroit under the full support of the Wu Tang Corporation label, via East Coast sound meets Midwest lyrics. Now, IQ's bar is one of the most musically eccentric venues in Green Bay, known for its artistic approach to live music and talented entertainment. It was IQ's pioneering spirit and open mind set that gave way to this hip hop invasion. I wonder how many people in our area realize that rap / hip hop can be performed live even on a local level. Now, rap is huge on the radio, MTV, and record sales not to mention there isn't a day that goes by that I don't hear someone bumping something going down Main Street. So you would think that our town would be dying to catch a show like this, right? I have so much respect for Bronze Nazareth and Crew, Beace and IQ's and for the way they made the best of the turn out! Local rapper Strife Divine started off with the ramp up and, though a little recessive on stage, their first run earned some respect and they got to encore between Bronze Nazareth's sets. Then Mc Sprite took stage. BEACE on Black Day In July Productions was a real ramp up enticing the barivians to dock the drinks and head over to the stage for a little "When I say BEACE! you Say wrecked it!" 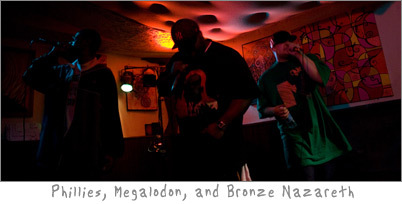 Then the show hit Bronze he mixed it up with WiseMen's Phillies and Black Day in July Production's June Megalodon. Now the thing I really like about Bronze Nazareth's back tracks is the element of true hip hop bass, snare, and high hat beats and the ancient soul and jazz loops. This music really does have that Wu Tang elements sound from the beat tempo to the classic 60s TV killer bee sound bytes. For traveling efficiency reasons the back tracks were served via CD to PA and then Bronze and crew championed three live mics on stage. The way they space out their rhymes and lyrics and have them landing on beat gives it a real heavy feel. Never doubling it up much on the vocals except for accents, keeps the sound real clean. Bronze's style is cleverly raw, and gives a glimpse into Detroit street life while never clearly choosing a side on right or wrong, but artistically laying out the reality for you to decide. Phillies' style is laid back and narrative, weaving stories and lacing it up with rhymes. Phillies is completely chill and concentrated on the mic especially during the freestyle joust sessions vs Bronze and Megalodon. June Megalodon is a street level metaphoric, narrative and creative writer and brings it down heavy on beat. After the first set I had a chance to hang with them and got the sense that they were relaxed, comfortable, and real people with a real wicked sense of humor. They live their words and do what they love in true underground indie fashion. It was awesome to see the Bronze Nazareth show at eye level and at the front of the stage, Hip Hop/Rap this talented and of this caliber is rarely seen from that perspective and is all but non-existent in the Green Bay area. Thanks to IQ's, support for this music it may mean that we will be able to catch some live Hip Hop/Rap in the Bay in the future. Be Sure check out Bronze's other group the "Wisemen," The Bronze Nazareth myspace, Murder 1 Clothing, BEACE myspace, The Wu Tang Clan, and Big Up DETROIT for bringing it across the lake to IQ's! Check Out Bronze Nazareth's Album "Thought for Food, Vol. 1 & 2" Available on iTunes!